Today our feet are walking in the shoes of victims and families of victims of domestic violence. It’s the disease no one wants to talk about, but everyone likes to discuss when “celebs” like Chris Brown are involved. Sadly, Whitney Houston dies. We remember she was a victim of DV, but in the end, its still quiet on the Western Front – as violence continues to rule the way of the the world. 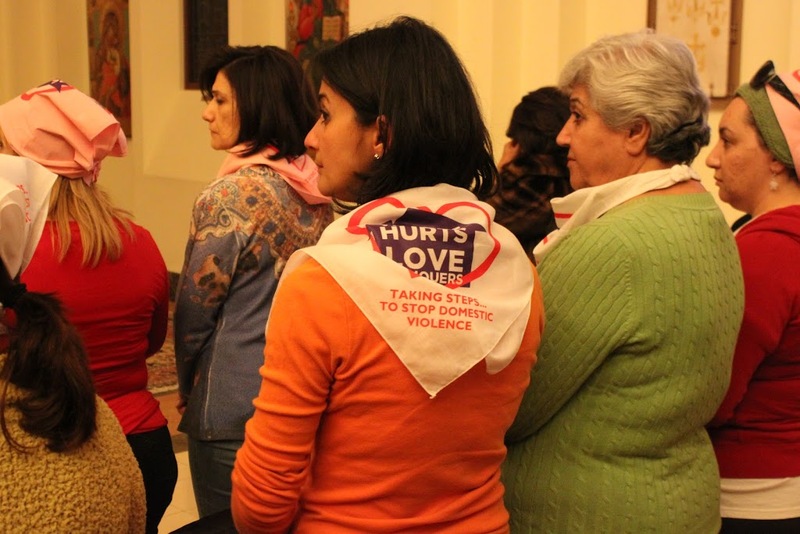 Here is a press release from a recent walk against Domestic Violence we took within the framework of the Western Diocese – addressing the issue in the Armenian world. It’s one part of a larger problem – but still, we’ve taken the first steps. Burbank, California – In the West its known as Valentine’s Day, but if you celebrate Christmas on January 6, as do the Armenians, February 14 is the Feast of the Presentation of Christ – 40 days after Christmas. By the order of His Holiness Karekin II, Catholicos of All Armenians, this day has been dedicated to young couples and families. And so, over 500 people, representing families in all stages of life, gathered at the St. Leon Armenian Cathedral on the eve of the feast to participate in a unique ritual that celebrates the strength of the family. It was also an evening to focus a matter that hurts families and is too often hid and forgotten. In response to the alarming problem of domestic violence His Eminence Archbishop Hovnan Derderian, the Primate of the Western Diocese, formed a task force in September 2011. Father Vazken Movsesian was appointed to head the group and develop programs that would not only heighten awareness of the problem, but also provide sanctuary, spiritual counseling and healing to victims and families. The first event of the Task Force took place on the feast of Presentation with a 8.8K Walk from the St. Peter Armenian Church in Glendale to the St. Leon Cathedral in Burbank. Over 60 walkers, ages 8 to 80, took to the streets under the banner, “Violence Hurts; Love Conquers.” Cars honked in solidarity while walkers discussed and explained domestic violence to people along the route. Officer John Gilkerson of the Glendale Police Department joined the walk to demonstrate the importance of cooperation from the department and the City. Priests, lawyers, artists, mechanics, construction workers, nurses were all there – each of them a testament that Domestic Violence hurts everyone, from all walks of life. 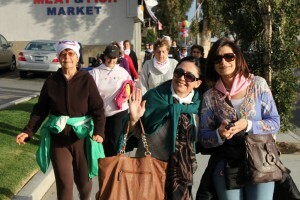 At the St. Leon Cathedral the walkers arrived singing Armenian church hymns. In the sanctuary, the clergy of the Western Diocese led the prayers for the Presentation. Archbishop Derderian welcomed the walkers and emphasized the importance and seriousness of the evening, as a time for introspection and strengthening of the family. His Eminence is known for tackling some of the large social problems within the community, and this evening proved to be an example of his dedication and passion for making the Church real in the life of the community. The church was filled to capacity with overflow in the courtyard. Fr. 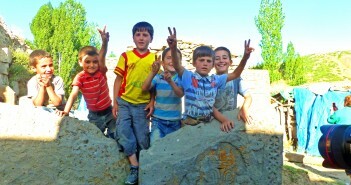 Vazken Movsesian addressed the congregation by explaining the work of the Task Force. The number of reported Domestic Violence cases has escalated in recent years. Fr. Vazken admitted that he was not moved by the statistics because, “One case, is too many.” He noted stories of Whitney Houston and Chris Brown at the Grammys, that were headlining the news that same evening. He therefore challenged the Armenian community to come “Into the Light” and talk openly about Domestic Violence. He further introduced the walkers – some who represented dead victims of violence, daughters, mothers, and recounting stories of families and victims that had become all too personal for him. At the end of his speech, Fr. Vazken called upon artist Gregory Beylerian to present a specially created icon to Archbishop Derderian. 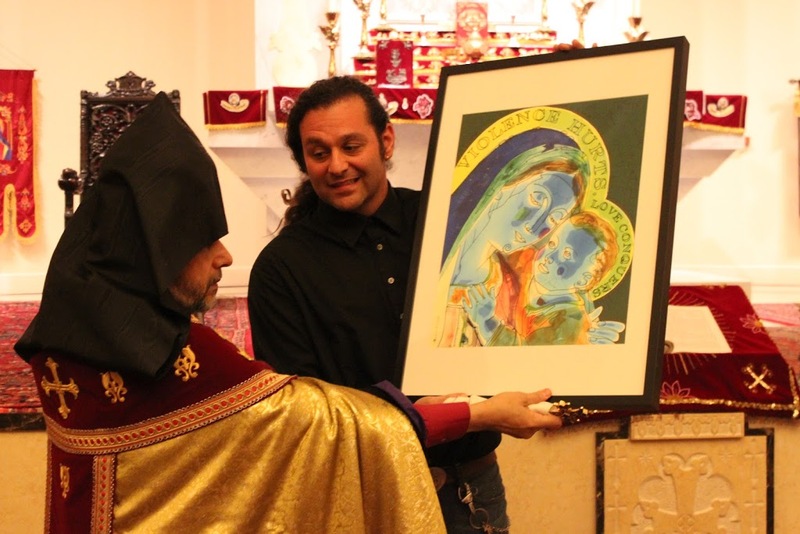 The Mother-and-Child icon donned halos above their heads to reflect power of Christ, that “Violence Hurts; Love Heals.” Artist Beylerian, who also walked with the group from Glendale, made the presentation to the applause of the congregation. Mashdots Jobanian, Director of Christian Education for the Western Diocese, and member of the Task Force, was called upon to deliver the message of the Day. He spoke about the power of Love over all evil. Quoting from Corinthians 13, recounted St. Paul’s words that all of our efforts and activities mean nothing if they are absent of love. He used the occasion to invite families, husbands/wives, to recommit to one another in the power of Love. The Holy Spirit was at work in the Cathedral as every word brought a new message of hope for the victims and their families and gave an invitation to families to find God’s love in their families. 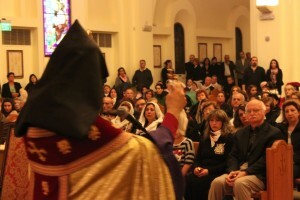 The Archbishop blessed the congregation, especially the families, the newlyweds and their children. In procession, the entire congregation went to the courtyard where St. Leon parish priest, Fr. 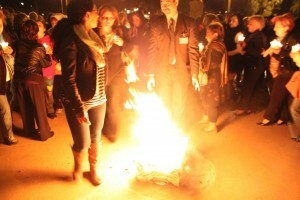 Khajag Shahbazian, brought a ceremonial flame off of the holy altar as a symbol of Christ’s Light. Archbishop Derderian lit a bonfire around which the people congregated that evening, to celebrate the power of love, family and God. The Domestic Violence Task Force accepted sign-ups that evening for people interested in helping in this effort. A commitment of time and energy is required. For more information call the Western Diocese 818.558.7474 or write to info@inhisshoes.org. Copies of the icon of Mother and Child are made available by the artist for $100 each with proceeds benefitting the Domestic Violence Task Force.